In fact, since I wrote my 5 beauty tricks to make your face look thinner post a few weeks ago and discovered that sleek, straight hair makes your face look fatter, I have been obsessed with figuring out how to transform my dull, boring locks in beautiful, face-framing curls. 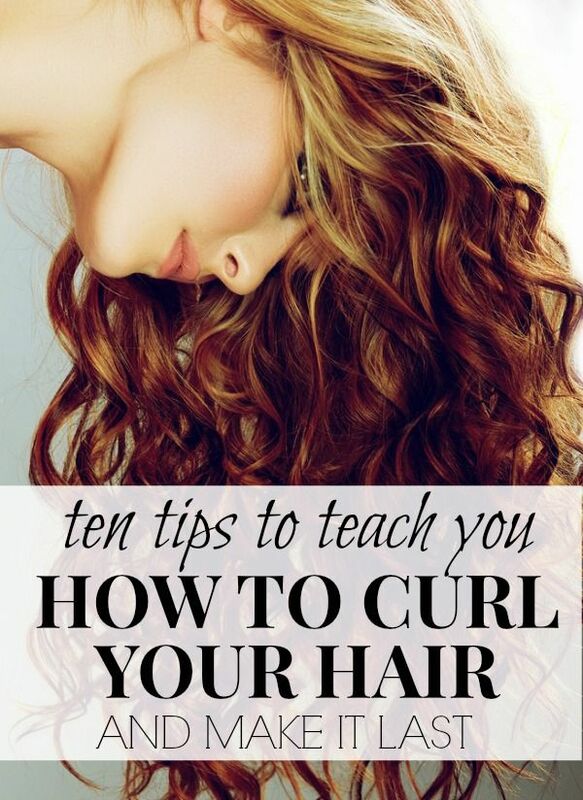 The good news is, with a little research and practice (okay, a lot of research and practice), I’ve finally figured it out, and today I’m going to teach YOU how to curl your hair and make it last. I’ve always known thick, blunt ends won’t hold a curl, and that long layers work best for beach waves, but it wasn’t until I read how to make your curls stay by Hair and Make-up by Steph that I realized the health of your hair plays an important role, too. In fact, the more damaged and split the ends of your hair are, the harder it will be to curl your hair. We all know that unwashed hair holds a style better than freshly washed hair (right? ), but did you know that cutting back on the hair conditioner can also help your hair hold a curl better? No? Neither did I! All Woman Stalk tells you all about this, and more, with her tips to help you curl pin straight hair! On the days when you’re skipping the hair wash, a little dry shampoo will do wonders in adding some volume and getting rid of any excess oil. I prefer Oscar Blandi Pronto Dry Shampoo, but there are heaps of other options that work just as well. My hairdresser and I swear by Moroccan Oil Volumizing Mousse, but I’ve used lots of other (cheaper!) alternatives from our local drug store, and I’ve never had any issues. Just make sure to read the labels and find something that suits your hair type. Before you bust out the curling iron, make sure to apply a heat protector to your hair so you don’t damage it. I really like TRESemme Thermal Creations Heat Tamer Protective Spray because it’s inexpensive, smells good, and gets the job done, but I highly recommend checking out this list of the best heat styling products by totalbeauty.com to find the one that’s perfect for your locks. I always thought it made sense to clip my hair into different layers, and start curling it from the bottom up. That’s what I do when I straighten my hair, so it just seemed like the natural thing to do. But when I told my hairdresser this, he almost died of laughter before showing me how much easier (and quicker!) it is if you start from the top and work your way down. Live and learn, I say! If I could only give you ONE piece of advice about how to get your curls to last, it’s this: roll each fresh curl around your finger, fasten it to your head with a bobby pin, and then, when all of your hair has been curled and pinned, spray with hair spray, leave for 10 minutes, and remove the curls one by one. I learned this trick after reading this AWESOME hair curling tutorial on Cosmopolitan, and it has been a life-changer for me. It takes me LESS time to curl my hair with this method, and the end result is always bouncier curls that last all day long. Always lock in your look with hair spray. I prefer Moroccanoil Luminous Hairspray, but you’ll find heaps of fantastic options at your local drugstore. And don’t forget to grab a small bottle for your purse – you’d be amazed at what a little spray can do to revitalize your curls at the end of the day!